Tonight it feels cold, and a small idea of what cold will mean in a month or so. 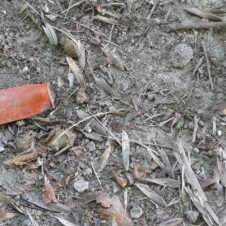 And its the season where things get shot. As top predator and chief meddler we have to keep check on the natural world we have squeezed into a corner. 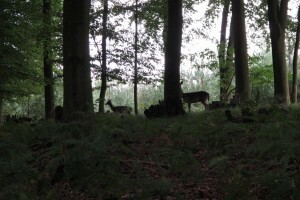 The deer here (which are Fallow not Roe as I said before) are culled in November and the venison sold. I would try it if I was still here. The big freezer container near my hut has been checked and readied for the season. Pheasants which have been carefully reared, released and are dashing foolishly about getting squashed on the roads, will be shot for sport. Far more are shot than can be eaten, according to Richard Mabey, and hundreds are buried. Badgers will be culled as they are supposed to be carriers of bovine turburculosis, but opinion is divided on this. Meanwhile, its suddenly my last night and I won’t be here to be part of these conversations. 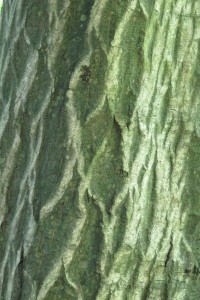 I have spent most of my eight weeks getting to know this wood. And I do know things. 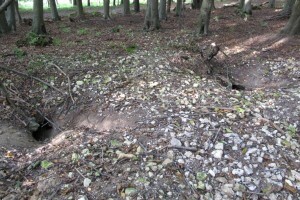 I know where there is a magnificent double holed badger sette. I know where I am likely to see deer and when. King’s wood Fallow deer are quite dark, and some are white. 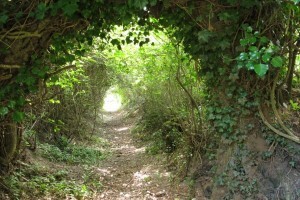 I know what a holloway is and have followed some down out of the chalk into the clay at the valley bottoms. 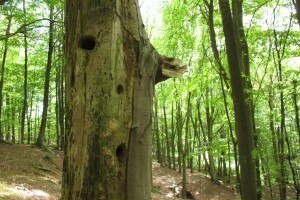 I have seen the Greater Spotted Woodpecker and the shy Green Woodpecker and see the holes they drill so loudly. Their holes end up so round and neat. 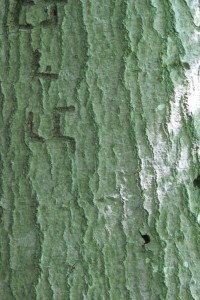 Beech is usually written on. 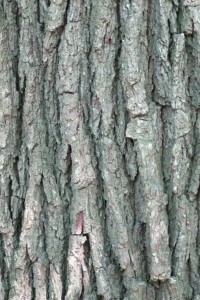 In a hundred years there will be big Oaks in King’s Wood. Water sinks down fast in the chalk soil of the Wood, and to keep it above ground for animals to drink traditionally involved making a shallow pond and lining it with clay, called a Dewpond. This is a very old one, and where I go when I want to see water. 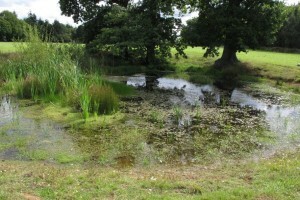 The Dewpond in Jackets Field, next to the Wood. 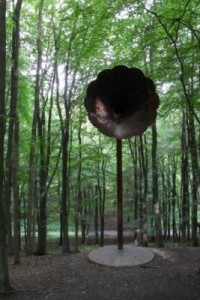 Jem Finer’s Score for a Hole in the Ground is, I think, the most beautiful work in King’s wood. Score for a Hole in the Ground , Jem Finer. 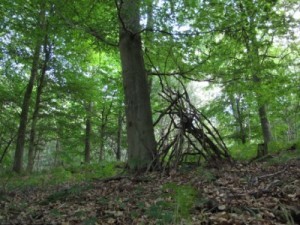 And I have found many beautiful structures made by children which persist long after they have finished their games and which I have made the starting point for my own response to being in King’s wood. I know the names of lots of things, I know the shape of the Wood and the silhouettes of some birds on the wing and trees in the distance. To know something really deeply though takes time. Knowing names is a kind of knowledge but understanding how things behave is a deeper knowing. What birds do through the seasons, what the light is like on the shortest day, how the Wood looks bare of leaves. At Deep River, Colin tells me, the Boobooks have hatched a family, which seems very early – the last two years we have heard them chirring in January. My diary there is waiting to be added to again, and will be enriched by the texture of this gentle place.